Accenture began as the business and technology consulting division of accounting firm Arthur Andersen in the early 1950s when it conducted a feasibility study for General Electric to install a computer at Appliance Park in Louisville, Kentucky, which led to GE's installation of a UNIVAC I computer and printer, believed to be the first commercial use of a computer in the U.S. Joseph Glickauf, an early pioneer of computer consulting, held a position as head of Arthur Andersen's administrative services division. In 1989, Arthur Andersen and Andersen Consulting became separate units of Andersen Worldwide Société Coopérative (AWSC). Throughout the 1990s, there was increasing tension between Andersen Consulting and Arthur Andersen. Andersen Consulting was paying Arthur Andersen up to 15% of its profits each year (a provision of the 1989 split was that the more profitable unit – whether AA or AC – pay the other the 15 percent), while at the same time Arthur Andersen was competing with Andersen Consulting through its own newly established business consulting service line called Arthur Andersen Business Consulting (AABC). This dispute came to a head in 1998 when Andersen Consulting put the 15% transfer payment for that year and future years into escrow and issued a claim for breach of contract against AWSC and Arthur Andersen. In August 2000, as a result of the conclusion of arbitration with the International Chamber of Commerce, Andersen Consulting broke all contractual ties with AWSC and Arthur Andersen. As part of the arbitration settlement, Andersen Consulting paid the sum held in escrow (then $1.2 billion) to Arthur Andersen, and was required to change its name, resulting in the entity being renamed Accenture. On 1 January 2001, Andersen Consulting adopted its current name, "Accenture". The word "Accenture" is derived from "Accent on the future". The name "Accenture" was submitted by Kim Petersen, a Danish employee from the company's Oslo, Norway office, as a result of an internal competition. Andersen felt that the name should represent its will to be a global consulting leader and high performer, and also intended that the name should not be offensive in any country in which Accenture operates. 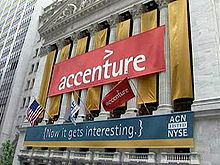 Accenture's banner hanging on the New York Stock Exchange (NYSE) building for its initial public offering on 19 July 2001. On 19 July 2001, Accenture's initial public offering (IPO) was priced at $14.50 per share, and the shares began trading on the New York Stock Exchange (NYSE); Goldman Sachs and Morgan Stanley served as its lead underwriters. Accenture stock closed the day at $15.17, with the day's high at $15.25. On the first day of the IPO, Accenture raised nearly $1.7 billion. In October 2002, the Congressional General Accounting Office (GAO) identified Accenture as one of four publicly traded federal contractors that were incorporated in a tax haven. The other three, unlike Accenture, were incorporated in the United States before they re-incorporated in a tax haven, thereby lowering their US taxes. Critics, most notably former CNN journalist Lou Dobbs, have reported Accenture's decision to incorporate in Bermuda as a US tax avoidance ploy, because they viewed Accenture as having been a US-based company. The GAO itself did not characterize Accenture as having been a US-based company; it stated that "prior to incorporating in Bermuda, Accenture was operating as a series of related partnerships and corporations under the control of its partners through the mechanism of contracts with a Swiss coordinating entity." Accenture engaged in an IT overhaul project for the National Health Service (NHS) in 2003, making headlines when it withdrew from the contract in 2006 over disputes related to delays and cost overruns. The government of the United Kingdom ultimately abandoned the project five years later for the same reasons. Accenture announced on 26 May 2009 that its board of directors unanimously approved changing the company's place of incorporation from Bermuda to Ireland and would become Accenture plc. Accenture was chosen to replace CGI Group as the lead contractor for HealthCare.gov in January 2014. In December 2014, Accenture won a $563 million contract to provide ongoing maintenance, software development and technology support for HealthCare.gov through 2019. In July 2015, the United States Department of Defense awarded a major Electronic Health Records contract to Cerner, Leidos and Accenture. The contract valued $4.33 billion will serve 55 hospitals and 600 clinics. Accenture Federal Services and Leidos will play the role of configuration specialist, while Cerner is the prime contractor. On 29 August 2017, Apple Inc. announced a partnership with Accenture to create iOS business solutions. In June 2018, Accenture generated controversy over the amount the firm has been charging to recruit 7,500 Customs and Border Protection officers. Under the $297 million contract, Accenture had been charging the US Government nearly $40,000 per hire, which is more than the annual salary of the average officer. According to a report published by the DHS Office of Inspector General in December 2018, Accenture had been paid $13.6M through the first ten months of the contract. They had hired two agents against a contract goal of 7,500 hires over 5 years. The report was issued as a 'management alert', indicating an issue requiring immediate attention, stating that "Accenture has already taken longer to deploy and delivered less capability than promised". For the fiscal year 2018, Accenture reported earnings of US$4.060 billion, with an annual revenue of US$41.603 billion, an increase of 13.2% over the previous fiscal cycle. Accenture's shares traded at over $159 per share, and its market capitalization was valued at over US$104.2 billion in October 2018. Accenture Strategy provides business strategy, technology strategy and operations strategy services. Accenture Consulting provides technology, business and management consulting. Accenture Digital provides digital marketing, analytics and mobility services. Accenture Technology focuses on technology solutions, implementation, delivery, and research & development, including its Technology Labs for emerging technologies. Accenture Operations focuses on an "as-a-service" model of service delivery. This includes business process outsourcing, IT services, cloud services, managed operations, security and infrastructure services. In 2011, Accenture launched a new campaign of results-based ads featuring clients such as Marriott, Unilever and the Royal Shakespeare Company alongside its slogan “High performance. Delivered”. As of 2018, Interbrand ranked Accenture No. 34 on its list of best global brands. The brand consultancy noted Accenture's focus on branding and marketing of its Accenture Strategy, Accenture Consulting, Accenture Digital, Accenture Technology and Accenture Operations divisions. From at least 2005 until December 2009, Accenture used Tiger Woods as a celebrity spokesperson and advertised using the service mark "Go on, be a Tiger" and the ancillary statement "We know what it takes to be a Tiger" in association with his image. On 13 December 2009 after details of Woods' extra-marital affairs were exposed, the company terminated Woods' six-year sponsorship deal. The company uses a standardised system of branding, with extensive use of the font Graphik. From 1999, the firm's culture was parodied by the webcomic Bigtime Consulting, operated pseudonymously by its San Francisco-based employee James Sanchez. In 2016, Accenture was ranked No. 289 on the Forbes Global 2000 list. In 2016, the firm was named 15th in the Top 50 Companies for Diversity by DiversityInc. In 2017, Accenture was ranked No. 272 on the Forbes Global 2000 list. In 2017, Accenture was ranked No. 305 on the Fortune Global 500 list. In 2017, the firm was named 14th in the Top 50 Companies for Diversity by DiversityInc. Accenture is one of 12 best management consulting firms of 2017 in America according to Forbes. In 2018, Fortune magazine named it as the world's most admired Information Technology Services company. In 2018, Accenture was ranked No. 288 on the Forbes Global 2000 list. In 2018, Accenture was ranked No. 316 on the Fortune Global 500 list. In 2018, the firm was named 9th in the Top 50 Companies for Diversity by DiversityInc. In 2019, Fortune magazine named it as the world's most admired Information Technology Services company. ^ a b Stacey Jones (11 January 2019). "Accenture Chairman & CEO Pierre Nanterme Steps Down for Health Reasons David Rowland Appointed Interim Chief Executive Officer Marge Magner Named Non-Executive Chair". Retrieved 11 January 2019. ^ "About Accenture". Retrieved 10 December 2015. ^ a b c d e f "Accenture Q4 FY 2018 performance". Accenture.com. Retrieved 27 September 2018. ^ a b "Fact sheet". Accenture. Retrieved 11 January 2019. ^ "Fortune Global 500 – The World's Biggest Companies - Accenture Profile 2011". CNN. Retrieved 24 March 2014. ^ "Accenture Financial Statements 2015". Accenture.com. 24 September 2015. Retrieved 6 November 2015. ^ "Accenture says India employees have to specialise". ^ Marek, Lynne (27 February 2016). "Guess which Illinois company uses the most worker visas". Crain's Chicago Business. Retrieved 15 July 2016. ^ Mini Joseph Tejaswi (2012-07-18). "Accenture in India". Articles.timesofindia.indiatimes.com. Retrieved 2013-08-10. ^ "Accenture To Add 500 Jobs in Chicago". WBBM-TV. 11 October 2011. Retrieved 10 December 2015. ^ a b Brachear, Manya A. (28 July 2005). "Joseph Glickauf Jr. 1912-2005". Chicago Tribune. Retrieved 10 December 2015. ^ Betts, Mitch (29 January 2001). "GE's Appliance Park Still an IT Innovator". Computerworld. Retrieved 10 December 2015. ^ Betts, Mitch (2 July 1990). "The Univac I: First in the field". Computerworld. Retrieved 10 December 2015. ^ Martin, Mitchell (8 August 2000). "Arbitrator's Ruling Goes Against Accounting Arm : Consultants Win Battle Of Andersen". The New York Times. New York City: The New York Times Company. Retrieved 1 March 2014. ^ Dobbs, Lou (9 March 2004). "Exporting America". CNN. Retrieved 3 May 2011. ^ "Information on Federal Contractors That Are Incorporated Offshore". gao.gov. General Accounting Office. Retrieved 4 December 2017. ^ "Accenture to quit NHS technology overhaul". The Guardian. Retrieved 18 July 2014. ^ "NHS pulls the plug on its £11bn IT system". The Independent. Retrieved 18 July 2014. ^ "Accenture Newsroom: Accenture Announces Proposed Change of Incorporation to Ireland". newsroom.accenture.com. 26 May 2009. Retrieved 6 August 2010. ^ "Accenture chosen as lead contractor of Obamacare website". Yahoo!. Retrieved 28 February 2014. ^ Sy Mukherjee (30 July 2015). "Cerner, Leidos, & Accenture win massive $4.3B Defense Department EHR contract". Healthcare Dive. Retrieved 27 August 2017. ^ "Apple and Accenture partner to create iOS business solutions". Apple Newsroom. Retrieved 2017-08-31. ^ NOAH LANARD (14 June 2018). "Border Patrol Is So Desperate for New Agents, It's Spending Millions to Help Recruits Finish Their Applications". Retrieved 19 June 2018. ^ Geneva Sands (10 December 2018). "'Serious' issues with $297 million CBP hiring contract, internal watchdog says". Retrieved 10 December 2018. ^ "Accenture Total Assets 2006-2018 | ACN". www.macrotrends.net. Retrieved 2018-10-29. ^ "Analyst Commentary: Accenture's digital push will boost consulting prospects". Professional Outsourcing Resources. 3 January 2014. Retrieved 30 January 2014. ^ "Accenture Consulting". www.accenture.com. Retrieved 2015-09-02. ^ Rayana Pandey (5 December 2013). "Accenture launches digital marketing capabilities. Should agencies worry?". Marketing. Retrieved 30 January 2014. ^ Arik Hesseldahl (5 June 2013). "Former HP Labs Head Prith Banerjee Joins Accenture". All Things D. Retrieved 18 February 2015. ^ Stuart Lauchlan (25 September 2014). "Accenture's offensive on the $5bn digital opportunity". Diginomica. Retrieved 30 January 2015. ^ Elliott, Stuart (17 November 2011). "Accenture Calls on Clients to Help Make a Statement". The New York Times. Retrieved 10 December 2015. ^ "Best Global Brands 2018 Rankings". Interbrand. 2018. Retrieved February 6, 2019. ^ "Best Global Brands 2015". Interbrand. Retrieved 10 December 2015. ^ "Accenture cuts Tiger Woods sponsorship deal". BBC News. 14 December 2009. Retrieved 6 August 2010. ^ "New logo and identity for Accenture". Brand New. 16 February 2017. Retrieved 18 April 2017. ^ "Bigtime Consulting archive". 'Bigtime Consulting'. ^ Gardner, Jim. "Web satire causes Bigtime headaches for Andersen". San Francisco Business Times. Retrieved 22 November 2015. ^ Alsop, Ronald. "Transgender, at the office". Retrieved 2018-04-16. ^ "The World's Biggest Public Companies". Forbes. 2016. Retrieved 15 July 2016. ^ "312: Accenture". Fortune. 2016. Retrieved 17 October 2016. ^ "The DiversityInc Top 50 Companies for Diversity". DiversityInc. 2016. Retrieved 18 April 2017. ^ "The World's Biggest Public Companies". Forbes. 2017. Retrieved 26 July 2017. ^ "Global 500". Fortune. 2017. Retrieved 26 July 2017. ^ "The DiversityInc Top 50 Companies for Diversity". DiversityInc. 2017. Retrieved 26 July 2017. ^ "America's Best Management Consulting Firms 2017". Forbes. Retrieved 2017-08-16. ^ "World's Most Admired Companies". Fortune. 2018. Retrieved 9 February 2018. ^ "The 2018 World's Most Ethical Companies Honoree List". Ethisphere Institute. 2018. Retrieved 17 May 2018. ^ "Accenture: #60". Fortune. 2018. Retrieved 17 May 2018. ^ Margie Kuchinski (3 May 2018). "Corporate Responsibility Magazine Announces 2018 100 Best Corporate Citizens". 3BL Association. Retrieved 17 May 2018. ^ "The World's Largest Public Companies". Forbes. 2018. Retrieved 28 August 2018. ^ "Global 500". Fortune. 2018. Retrieved 28 August 2018. ^ "The 2018 DiversityInc Top 50 Companies for Diversity". DiversityInc. 2018. Retrieved 26 July 2017. ^ "World's Most Admired Companies". Fortune. 2019. Retrieved February 1, 2019. Wikimedia Commons has media related to Accenture.